Good morning everybody, I hope you all are having a fab day! I colored him as usual with Copic sketch markers. I just distress all edges with tea dye DI and some stickles on butterfly wings. Sizzix, momory box and Marianne designs. 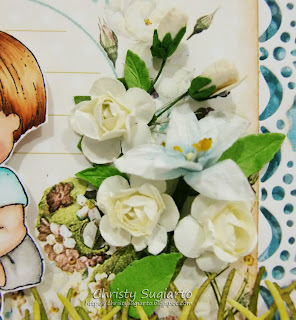 Blue flowers is from Magnolia and the others are from my stash. Thank for stopping by today and happy crafting !! OMG! So sweet and so wonderful bright colors. Thanks for joining us at Stempel-Magie. Have a fab weekend. Your cute Edwin is super sweet Christy. The garden scene is just perfect for this little guy. Have a wonderful weekend. OH MA GOSH this scene is absolutely adorable!! WOW! Thank you so much for joining our "Anything Goes" challenge and hope to see you play again! Such an adorable card Christy. 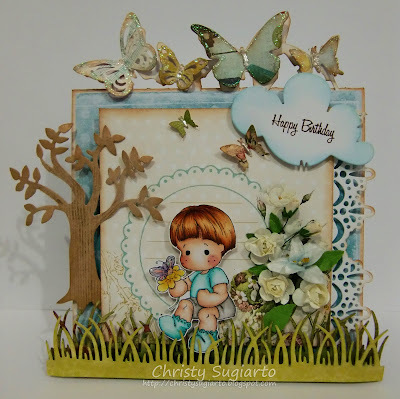 fantastic card, love the gorgeous scene you've created! Wow how Adorable! Looooove all your Amazing Layers and Stunning Embellies! O, wat is dit weer een schitterende kaart! Deze Edwin is wel echt een schatje!! En zo'n mooi tafereeltje heb je gemaakt, ik ben er weg van! Love this card Christy, fab! 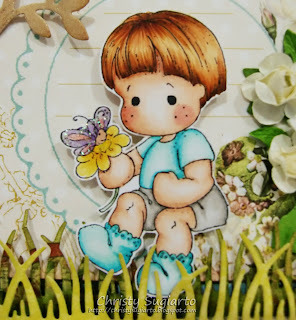 super cute card, your coloring is amazing...hope you have a fabby weekend! Wow, how lovely! Very nice details.